football Archives – Page 8 of 8 – A Write Old Life. Recently, whilst undergoing the trauma of a Virgin trains journey from Watford to Manchester, I met a woman. She was middle aged, expensively dressed, stunningly pretty in a Helen Mirren type of way and remarkably intelligent. All attributes which marked her out as being on a slightly different social and intellectual plane than myself. Indeed, it’s fair to say that in any other circumstance, we would never have met in a million years. However, on this occasion, fate threw us together and as a result, we spent two glorious hours sharing one of those experiences which come along all to rarely but which, when they do, leave you glowing with fulfilment and achievement. Sad to say, we never even exchanged names and when she left the train at Stafford, we both knew that we would never meet again. But we’re adults and we knew what we were doing. So why not? What did we do? Well, we moaned. Non-stop. Not just about Richard Branson and his trains, but about the Labour Party, today’s youth, the weather and even the state of English football (not a subject I would never normally enter into with a female but hey…). It was fantastic. Reflecting on our conversation as I went on to eventually complete my journey some hour and a half late, I realized how much I love a good moan. It isn’t just good for the soul it’s good fun. Which is a good job really, because I have a lot to moan about. After all, not only have I been cursed with decidedly average looks, but I’ve always been a bit on the ‘plump’ side. Add this to the fact that I began losing my hair quite early on in life and an arse the size of the Isle of Wight and you can see why I harbour a deep rooted resentment toward my parents. To make matters even worse, in my teens, I developed an affection for Watford football club. And whilst that was great at first, I have since learnt the full implications of such an obsession. Especially the financial ones! I could go on, but you get the drift. 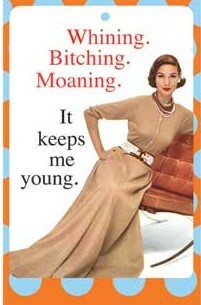 However, since I’ve been writing, I’ve learnt that moaning has other benefits. For not only does it provide a much-needed outlet for frustration and stress, it is also a fabulous defence mechanism. Let’s face it, being a pessimist means you are rarely disappointed. But more importantly, moaning is actually a valuable and under appreciated research tool. Listening to people moan can be an incredibly useful and informative experience because unlike any other form of communication, moaning is completely disarming. After all, we only really do it when we feel passionate about something and you can’t fake that like you can flattery or self-importance. It’s as real as it gets. And when you get that degree of feeling, that’s when you get truth and genuine opinion. Two things that are vital if you’re a writer searching for information or even some inspirational dialogue. So please bare that in mind the next time you get on a train and the only empty seat is next to a big bald miserable looking bloke. It might be me and you could be just the person I’m looking for. I am one of that lucky breed of individuals who has ended up doing a job, if you can call it that, which just happens to revolve around their all-consuming passion. As a result of this good fortune, what I do occasionally rules my life 24/7 to the point that if I’m not working by necessity, I’m doing by choice. Thankfully, my son has also become infected with this passion and no doubt, as the years pass by, the two of us will continue to enjoy our shared obsession not just because we’re father and son, but because…well, because we’re blokes. And as we grow older, we’ll talk about the good old days and how things were much better back … er, now, and moan about how it all went wrong. Which of course, it surely will. Because the thing of which I speak is of course, the glorious, but all too often disappointing game that is football. And if you follow football, as anyone who watch the pathetic efforts of our nations supposedly finest players in South Africa will be acutely aware, the chances are that you’re going to spend a good portion of your supporting life feeling depressed. To be honest, I guess that’s where the main attraction lies for me. I am after all, a natural pessimist and so it stands to reason that football is my ideal sport. After all, if you go to a game expecting to be disappointed, anything else is a serious bonus! But the other benefit the great game provides is that the pre-match pub has replaced the traditional campfire as the place where stories and legends are both told and heard. And who can deny the pure unadulterated joy which comes from hearing about someone else’s misfortune or the simple thrill of trying to work out if someone is lying through their teeth or not. The problem of course, is that every so often, you are expected to contribute. And tragically, I have one of those footballing stories that tread the fine line between bizarre and bull. A story that I still have difficulty believing even though I was the central figure. In short, I once saved a penalty taken by my own team in a game that we lost. Confused? Oh, it gets worse than that. Much worse. You see during my time in the RAF, I was the manager of our Squadron football team. A team, who I have to admit, were rubbish. The sad thing was, I was also a member of the defence and as we were leaking goals at a frightening rate, I eventually got to the point where I dropped myself. Anyway, come one particular match, against the side who were top of the table, we all turned up as normal but due to circumstances beyond their control, the opposing side only had ten players arrive. However, as they were superior to us in every aspect of their play, they were quite happy to play us with ten men, which, if nothing else, was pretty demeaning for our lot. Of course, the inevitable happened and just before half time, in the only attack we had managed to mount during the previous forty minutes, their keeper got seriously hurt and was carried off. They were now down to nine men and it looked like the game would have to be abandoned, at which point, sensing at least a point for my lads, I offered to go in goal for them promising faithfully that I would, of course, be totally impartial! Following various warnings from their captain and bearing in mind that we had only threatened their goal once in the first half, they reluctantly accepted my offer and I took my place in goal against my own team! But such was the lack of skill exhibited from my own players (this gets confusing) I had nothing to do for the rest of the half and at the break, gave my own team a rousing pep-talk designed to get them playing well enough to score a goal against me. However, as the second-half progressed, my own team remained pegged back in their (our) own half but the team I was in goal for still could not score. It had just began to look as though we (my real side) may well get that elusive point when suddenly, a hopeful punt from our defence (and that’s our as in my own team) released our centre forward who came charging toward me followed by their defence (the team I was playing for) who clearly who had little faith in my saving their skin. As our striker entered the box with me firmly rooted to the line, they hacked him to the ground and the ref awarded a penalty. This now meant that I was standing on the goal line, facing a penalty about to be taken by a player from my own side who could well end up securing their (our) first win of the season, and against the top of the table side. Their (their) whole side were now giving me dire warnings of what would happen if I didn’t at least make an effort to save it while my lot were shouting at me to let it in. Meantime, I was trying to let our centre forward know that I would go to my left by using exaggerated eye movements etc, and it seemed that judging by the wry smile on his face, he had got the message. As he ran up, I dived to my left and he, thinking that I had been telling him to put it to that side, put his shot exactly where I ended up with the result that the ball hit me and bounced back into open play. Such was the shock of my actually saving a penalty taken by my own side, that their (their) defenders won the ball, screamed up field and scored whilst my own team remained rooted firmly to the spot in total disbelief. Inevitably, as soon as the whistle blew, the repercussions began. And eventually, after a blazing row, I resigned my position as manager and never played for the team again. You see, I told you. Unbelievable. Like many people, I am at my happiest when I’m sitting down and doing bugger all. There is, as I’m sure you’ll agree, something incredibly gratifying about doing nothing. Indeed, it is fair to say that these days, having passed the magic five-zero, the avoidance of work, be it paid or domestic, doesn’t just give me huge amounts of pleasure, it’s actually a source of pride. Something that the half built brick barbecue in my back garden stands as a monument to. I actually first grasped the concept of idleness whilst serving in the Royal Air Force. For having worked hard for years and got nowhere, I suddenly realised that all of my immediate bosses were lazy so-and-so’s who were getting all the praise –and wages- while mugs like me did all the graft. However, in the forces, it’s not regarded as being idle, it’s celebrated as delegation. And once I embraced that idea, with both hands I might add, I pretty soon found myself flying up that promotion ladder. Tragically, outside the confines of HM Forces, things weren’t so easy. I soon learnt that being expected to actually work for a living wasn’t all it was cracked up to be. And I could never escape the idea that someone was driving around in a Aston Martin which I had paid for. I wasn’t happy with that at all, hence, the move into writing. It was the only occupation I could think of which allowed me to work from home, for myself and remain sitting down all day. Of course, I quickly discovered that being a writer does have other advantages. The most obvious of which was that I was able to justify my love of lounging around as either ‘thinking time’ or ‘clearing my head’ time. Both things for which, somewhat ironically, daytime TV is perfectly suited. After all, I have to get inspiration from somewhere. And if you watch This Morning long enough, sooner or later, every known form of life is going to pass by in front of your eyes. Watch MTV and you’re mind goes blank in minutes. Sadly, my wife has always been wise to this. And as time passes, and her life as a full-time mother, housewife and carer to her husband shows no sign of easing up, she is becoming increasingly irritated at my pathetic attempts to justify watching Sky Sports or reading Zoo at times when I should be working. And, it is fair to say that for a while, I started to feel a degree of sympathy for her case. Because the truth is, I have never really been inspired by either The Real Deal or Loose Women. And although the gloriously wonderful Holly Willoughby merits a fantasy-laden mention in my next movie, I hardly need to watch This Morning every day. However, recently I have had not one, but two odd experiences. Both of which made me realize that not only might my pangs of guilt be misplaced, but that maybe my commitment to time wasting has not been in vain. The first of them happened in Manchester. I had ventured North for some reason or another and was returning to the sanctuary of the South when, upon my arrival at Piccadilly Station, I was greeted by the stench and noise that can only be created by that relic of the so-called good old days, a steam engine. Of course, realizing that such a machine was in residence, my heart sank. For I knew exactly what was coming and sure enough, as I walked around the corner, I couldn’t see the beast for the hoards of middle-aged saddo’s pointing and muttering excitedly about piston sizes and boiler pressures. These weren’t your ordinary feeble part-time trainspotters you see standing on the platform at Euston with a notepad in one hand and a flask of tea in the other. These were the real deal hard-core spotters of the type who wear sleeveless anoraks covered in small metal badges and smell of meths. But as I watched what was going on, in a kind of detached bewilderment, it struck me as decidedly odd that in this day and age, not only could grown men be whipped up into an almost orgasmic frenzy by the sight of a simple machine, but that they would want to be. Then, two weeks later, for reasons to banal to relate, I had to endure a day at an old RAF airfield in Gloucestershire. As we were having a coffee in a café in the control tower, I happened to notice a group of elderly chaps in stained overalls, sitting in the corner and arguing over an old book. Being naturally nosey (it goes with the job) I soon learnt that they were aircraft enthusiasts in the middle of restoring an old De Haviland Comet. And they were having a heated discussion about the markings on a particular fuse box. Believe it or not, the book they were using contained the actual manufacturers drawings. It was a picture of tragedy. Reflecting on this and the Manchester experience as I headed homeward, the thought suddenly struck me that not only were all the people involved in the fuse box debate men, but that you never see any female trainspotters. And then I began to consider the possibility that maybe something else was going on. Maybe the people who indulge in these most unfathomable of practices do so not because they’re sad loners, but because it’s something to do with their spare time. And why on earth would anyone need to fill time? Isn’t it obvious? These poor men aren’t sad, they’re victims. Driven out of their own homes by bitter women who refuse to sit back and allow them the luxury of enjoying their hard earned time-off in the comfort of their own homes. Think about it. It makes perfect sense. I mean, why else would blokes have sheds? They’re the only space in the house that they can call their own! So, having deliberated over this at length, I have decided that rather than feel guilty about being idle, the fact that I am able to spend most of my time here in my own home at all should be regarded as a moral victory. And while it might not appear that I’m doing much, at least I’m happy which is the most important thing.